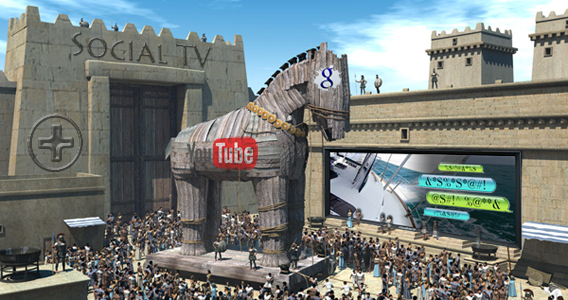 While Twitter and Facebook argue over who has more Klout, Google sends in a Trojan horse packed with YouTube’s Music Awards to ambush the kingdom of Social TV. “Forget Facebook and Twitter for a minute, if you will. With the YouTube Music Awards, Google’s big social TV move could have some symbolic collateral damage, namely to the stalwarts of the entertainment industry.” “If you’re Google, you’re sitting on a three ingredient formula for success: resources sufficient to craft your very own hyped-up award show, the online network to broadcast it over and, bettered by its recent splicing of Google+ DNA into YouTube comments, the social network to control the conversation. Modern Family Sync – every episode has a sync for fans to access as they watch.